Ramen is a dish that brings to mind days for many of us when we didn’t have much in the way of money where we filled pots with boiling water, dried noodles, and salty seasoning packets or prepackaged cups in office or dorm microwaves. We may have fond memories of the food, but that’s typically tied to sentiments of “remember when…,” rather than how delicious it was. Regrettably, this is not what real ramen is like, giving the dish a bad rap for most of us. If this describes your interactions with ramen, Morimoto Asia has a prescription for you to help change your mind. In fact, Morimoto Asia actually has three versions of ramen for you to sample. One of which features duck and two other versions that are perfect for the pork crazy amongst us. It’s one of these pork centric ramen dishes that we’re going to dive into today. The Tonkotsu Ramen begins with a base of rich pork broth and egg noodles. Added to these ingredients are roasted pork, wood ear mushrooms, green onion, sesame seeds, and pickled ginger. Before we start talking flavors, let’s be very clear, it takes a day and a half to prepare this dish. The Tonkotsu Ramen isn’t your college ramen, and it is worth every minute of the preparation time for this bowl. The smells and colors coming from the ramen when it was set before me were so intoxicating that I almost forgot to take a picture of it in order to get it into my mouth quicker. Even then, I only took one photo which is highly unlike me. But you can look for yourself, the wonderful browned edge of the pork, the vibrant greens and pinks of the onion and the ginger, and the opaqueness of the broth which lets you know this is not some thin, clear, flavorless broth. As for the smells, I wish this photo came in smell-o-vision, I really do, but you’ll just have to take my word on that. What you really want to know is how did it taste, right? The broth is just as rich as it looks with a complex, yet simple flavor stemming from the slow cooking process. The mushrooms are thinly sliced, with a snap to their texture instead of the usual rubber consistency from mushrooms in a soup. A quick aside, many Asian recipes call for wood ear mushrooms out of the belief that they are good for breathing and circulation. The roasted pork is buttery and wafer thin, and you’re going to wish you had several more pieces of it. The pickled ginger and green onions break up the heavier flavors with some intense flavors of their own. Overall, between its flavors, smells, and colors, it is a remarkably well-balanced dish. Every bite is a taste explosion and the Tonkotsu Ramen is definitely something I will not forget and will seek out again. Walking around Morimoto Asia you can feel the relaxed elegance of the place, with sumptuous furnishings, sparkling lights, and artistry in every detail. 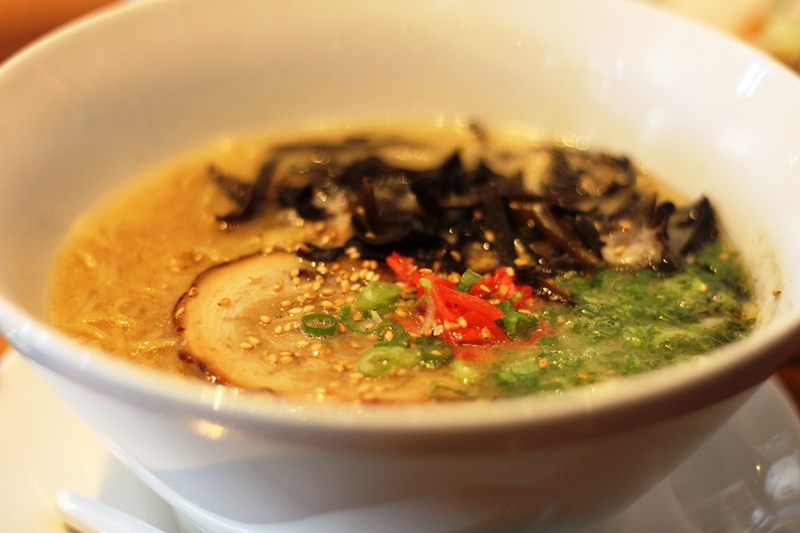 That feeling is reflected in the mastery and balance presented in the Tonkotsu Ramen. It is approachable, but not what you are expecting, and it’s a wonderful journey from the first steaming spoonful to the bottom of the bowl.